While strolling along the beach on Mystery Island, Peter the Acara decided that he was fed up. As the middle child, he’d tried to ignore the fact that his big sister Sheila got first dibs on all the books. After all, he had gotten second dibs. He understood that his younger sister Grace was more suited to becoming a warrior, even though he was older. He even accepted the fact that books could help her learn to use certain weapons more skillfully, and so he’d grudgingly agreed to third dibs on books. But ever since their owner had adopted Anna, Peter just didn’t know if he fit in with this family anymore. 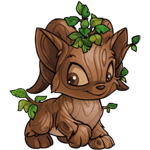 Anna got to visit the lab ray every day, and she was given new petpets as soon as they earned another avatar. Not that Peter wanted a new petpet; he loved his (zapped) Maraquan Snowickle very much. Still, it was vexing never to be the active pet (because Grace might get random stat boosts). And he just didn’t feel like he was contributing anything to the family. Their owner had no goals for him at all, it seemed. The clincher, though, was this morning’s mishap at the lab ray. Their owner had been in a rush; she didn’t even look at them before shoving Peter into the Lab Ray Scientist’s arms. Now the formerly Pirate Acara was brown. Brown! He’d fled on the first ship from Krawk Island to Mystery Island, too ashamed to face his fellow pirates at the Golden Dubloon. He waited anxiously, hoping his owner would find him and change him back. From what he could remember, she had just enough Neopoints in the bank and stock market to do so. As the day wore on, however, he began to lose hope. He wandered over to the training school, where Grace was working on her 250th defense boost. But with no codestones, he couldn’t train. It wasn’t fair. He was tough; he’d proven his mettle on the high seas and in the roughest ports around Neopia. Then he noticed Grace had left her weapons aside during training. Without really thinking about what he was doing, he snatched them: an Enchanted Wooden Bow, Sophie’s Wooden Spoon, a Geraptiku Attack Leaf, and a Leaf Shield. He hurried away, a bit ashamed about what he’d done. But maybe he could train a bit on his own with them, and then give them back. The best weapon he’d ever gotten was a Wooden Blocking Shield, after all. He headed back towards the beach, passing the trading post on the way. Wait, wasn’t that his owner setting up a trade? Peter wiped his eyes and looked up. “Sorry, Jhuidah,” he said. He was at the Cooking Pot. As he stared at the items going into the pot, an idea started to form in his mind. These Acara weapons weren’t really all that good, not for the amount of Neopoints they could be sold for. But Grace’s weapons, well, they were a warrior’s weapons, after all. But what if she couldn’t use them? What if they could only be used by an Acara? Then he, Peter, would become the family warrior. He gathered up the weapons that had scattered around and approached the Cooking Pot. As he tried to extricate the two bows, he was bumped from behind by a Draik impatiently waiting her turn. Peter fell headfirst into the Cooking Pot, weapons and all. Choking on the broth, he tried to pull himself back out. Fortunately, Jhuidah yanked him out by his britches. “The Cooking Pot is not for pets!” she shrieked. “Sorry,” Peter muttered, shaking the broth off himself. Jhuidah and the others suddenly gasped. “What?” he asked. “Take a look,” Jhuidah told him, nodding at the Pot. Peter crept over and peered at his reflection. Were those the leaves from the shield on his head? He felt his head. No, they were attached! And his skin wasn’t solid brown anymore. No, it had grain patterns... he was wooden! “I really shouldn’t,” she thought, but she didn’t want to get frosting on her new skirt by shoving the cake into her pocket, so she had to hold it. “It’s just too tempting!” she sighed, nibbling a bit as she waited for the Flat-u-less Tablets to restock. By the time she got the medicine, she’d polished off the fourth piece. When she got home, her sister Sheila asked, “What happened to you? I can see your stomach!” Grace was offended. Had she eaten too much? Was her tummy hanging out below her shirt? She looked down and gasped. Sheila actually had meant stomach, not tummy. She’d eaten so much, it had stretched her skin tight enough to be transparent! Sheila tucked her into bed and gave her Flat-u-less Tablets until she felt better, but Grace’s skin remained see-through. Sheila the grey Nimmo had been a bit spoiled. She was the scholar of the family, and the eldest, and so she was often excused from chores while she was studying. That suited her just fine. Who actually liked chores? Besides, her brother Peter never seemed to have much to do, anyway. “Sheila, it’s your turn to wash the dishes!” Peter called as she lazed on her Kau print bed. She heard his footsteps and grabbed the nearest book off her peanut bookcase. “Sorry, I’m studying... um, How to Break Codes and Influence Plot Events,” she told him, reading the cover of the book. He sighed, but went into the kitchen and started on the dishes. “I’m a strong fighter; once we figure out who did it, I’m sure my skills will be useful,” Grace exclaimed, gathering her weapons. “I’m a hard worker, and perhaps my insulting skills honed on the pirate ships will be useful,” Peter said. Sheila laughed. “Insulting skills? How could those be useful, silly?” she asked. “Well, what are you going to do? Lie on your bed and read?” he retorted. “Of course I’m going to read, and hopefully find a way to unfreeze the faeries!” she said haughtily. She walked over to her bookshelves and started pulling books that might have any information in them. “Well, we’re off,” Anna told her. “You might want to coordinate with the other scholars; we all need to work together to save Faerieland.” Sheila nodded, already absorbed in Secrets of Dirigible Construction. After her fourth book, Sheila started to get bored. None of her personal books seemed to have any useful information. She kept getting distracted by her more fun books, or just by daydreaming. Her siblings would occasionally come home to restock on supplies. When she heard them at the door, she’d dive for the nearest scholarly book and pretend to be absorbed. After the fourth time Anna came by, she didn’t even bother waiting for Sheila’s reply anymore; she just stuck her head in and said, “Getting fresh supplies,” before heading back out. Then suddenly there was a bright light outside the window. Sheila was turned to stone at the same time as the heroes. Anna ran back in, saying, “Faerieland just crashed! It’s going to take our warriors, puzzlers, scholars, and all hard workers if we have any hope of saving the faeries! Keep studying; I’m going to put a barrier around the house so you’ll be safe from any ricocheting magic.” Of course, Sheila couldn’t respond since she was already frozen, but Anna didn’t even seem to notice. After the heroes managed to save the faeries, Anna, Peter, and Grace returned home. “There’s a lot of work to be done, so we’ll still be in and out,” Anna said to Sheila’s back. Every time one of them stopped by the house, they’d say something to Sheila, but she never responded. When dinner was ready, Peter quickly set the table. “This is ridiculous,” Anna said. She stormed into Sheila’s room and grabbed her shoulder. “Come on, time to eat!” When Sheila still didn’t move, Anna shook her. Sheila toppled over like a statue. “Oh no!” Anna gasped. The three siblings rushed Sheila to Fyora. “How long has she been like this?” Fyora asked. “We don’t know,” Anna admitted. “The last time she said anything was... at least a month ago, maybe two?” The others nodded. Fyora said, “I’ll do what I can, but for pets, sometimes there are aftereffects if they’ve been under a curse too long.” Peter, Anna, and Grace whimpered. Sheila’s body was always a bit stiff after that, but she made sure she always did her fair share of chores. She promised that the next time Neopia was in crisis, she’d report to the nearest library to help research the solution in earnest. Anna was mystified. Maraquan soldier? Support Center? She had heard of the Maraquan War, but she was too young to have participated. And the Support Center had long been deserted. By asking around Maraqua, however, she discovered that the item she had received was a Maraquan War Token. The Kelp maitre d’ warned her, “If you didn’t participate in the war, you shouldn’t have gotten that. You should submit a bug report, and don’t do anything with it in the meantime.” Anna promised she would, and swam merrily on her way. She strung the token on a string and tied it around her neck for safekeeping. It was so pretty. She could keep it for a while, as long as she eventually submitted the bug report, right? Later that day, she visited the lab ray. She was becoming less scared of the ray; nothing terrible had happened to her yet (except for that awful day she’d had to spend as a Faerie Zafara). She bravely faced the ray, waiting for the familiar zrrpppt. The beam hit the Maraquan War token, and it started to burn. A bright blue light enveloped her, and she fell to the ground. The Lab Ray Scientist helped her to her feet. “That’s never happened before,” he muttered, scribbling in his notebook. Anna’s body felt stiff. She saw the remainder of the piece of string, charred at the edges. “Where’s the token?” she asked worriedly. As she reached down to search for it, she saw the token’s rune patterns across her arm. “Uh-oh,” she said. Her limbs were getting stiffer and stiffer. With her last energy, she neomailed her brother, Peter. Fyora was able to remove the stiffness from Anna’s body, but the markings remained. “Can’t we get the token back so I can give it to TNT?” Anna asked. Fyora shook her head. “You’ll have to send in a bug report and see what they say,” she told her. “Next time, send your bug report right away.” Anna promised she would. She never did have the courage to stand before the Lab Ray again, however. The quickest way to help the pets of the pound one pet at a time!